This festival returns to the Mill Creek Ravine — and you won’t want to miss it. Lights twinkle in the cold winter wind, twisting in the branches over a winding path. In the distance, the sounds of drums and dancers waft in on a cool breeze. The mystery and majesty of the Flying Canoë Volant festival returns to the Mill Creek Ravine. Cultures and experience mix and mingle in the cold over the first weekend of February in Edmonton’s river valley at a festival that showcases First Nations, Métis and European experiences in Canada. Passing through the ravine and up into La Cité Francophone, you could experience First Nations dancing, take a seat for some traditional storytelling or make maple taffy in the snow. “Very often we will observe a culture. We are trying to take that and say, ‘experience this.’ Audiences are encouraged to come in and enjoy the dance,” says Daniel Cournoyer, executive director of La Cité Francophone, the host of many of the Flying Canoë Volant festivities. That lived experience, the opportunity to partake in cultural activities and not just observe them, is what makes Flying Canoë Volant so special. Mill Creek Ravine takes on a magical quality, lights dangling in the winter skies, dancers and music filling the ravine with music and motion. The combination has been attracting bigger and bigger audiences since 2013, the first year of the Flying Canoë Volant. Organizers from La Cité Francophone had created the festival after taking over from the Mill Creek Adventure Walk, which drew a few thousand visitors every year. Last year, even with temperatures dropping below -30 Celsius, they managed to attract 30,000 people to the festival site. While magical evening strolls through the ravine are major draws, festival organizers also place a big emphasis on formal education. Last year, more than 3,600 children came to La Cité Francophone in the month leading up to the festival. Organizers are expecting a similar turnout this year. “Not only does it celebrate the Franco community, but it’s an opportunity for La Cité Francophone to really engage people not just in the historical francophonie, but the actual francophone experience in the province,” says Allan Jacobson, festival coordinator for Flying Canoë Volant. The name of the festival comes from an old French folktale (although there’s also an Indigenous folktale centred on a flying canoe). A group of coureurs des bois (woodsmen and lumberjacks) were homesick at New Year’s and wanted to make the trip home. They make a deal with the devil, who promised to fly them home in a canoe as long as they avoid using the lord’s name in vain or touch church steeples. In some versions, they make it home despite a few slip-ups, while in others they break their pact with the devil and are doomed to roam the sky in their flying canoe for eternity. 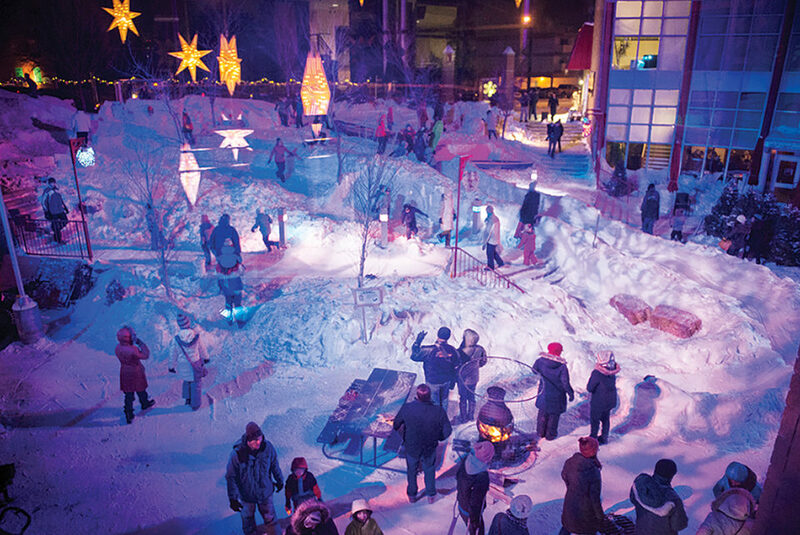 It’s a somewhat terrifying origin story for one of Edmonton’s premier winter festivals. Don’t let it scare you away.